We encourage you to be gentle with yourself as you undertake the self-study that this note provides. We encourage you to practice self- kindness, self-love, and patience. Doing this process will be painful. That is inevitable. But it does not have to be torture. The traumas of childhood were torture; repeating that in adulthood is not healing. We wish you strength and courage—and also ingenuity and self- respect. These are vital for self-therapy, and we believe to our cores that every person has them. It is just a question of tapping in. 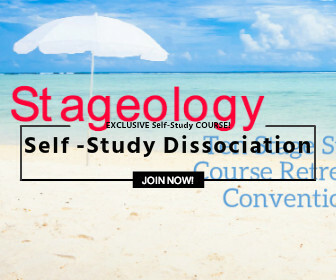 In Stageology we begin to understand that we have the power to recharge our lives whilst stop being dependent on substances or other people as an act of dissociation which effects both our self-esteem and security. We start to recognise that we have a truer self within that can heal and regain control of our lives, and that this is the reason – coupled with all of our unresolved childhood traumas!– that our lives has become so disturbed and dysfunctional. We understand when we communicate with the child within that at the core of our problems are all the traumas we experienced as a child. We acknowledge, and that’s why we come to the stages. When the child within can accept that when we can find a solution for the unresolved trauma of childhood coping strategies then the symptoms will start to become manageable and quickly loose power over our lives. All our dysfunctions will start to normalise instead of remaining constantly in the DRAMA of dissociation. This is a very fragile and delicate operation which requires truth trust and consent to be manifested to the satisfaction of the child within us. The Stages seek to help search for a our version of the "Truth" and our truth when found, accepted will set us free from dissociation and we learn that for us there is only one truth. This one truth is based on our daily reality. Reality is what is, whether we see it or not. Although truth is not subjective, our perspectives on truth can be subjective. Until a person becomes enlightened to realised truth– and can see full truth of his life and history – his vision of truth will be partially distorted. He will believe things to be true that are false. His knowledge of cause and effect will be limited. He will lie to himself and be deluded. Unresolved traumas block our vision from finding our truth. When we cannot resolve our traumas of childhood we are prevented from facing the truth of what has happened to us when we were at our most vulnerable. The true self the core of who each of us is, lives resplendent in our truth. It is connected to truth, and sees it clearly. When we reconnect with our true self and align with it in the full light of consciousness, we also know our own personal truth which becomes a liberating peaceful, whole experience and for the first time we feel free. Our conflicts are starting to resolve themselves with the help of the guides. We come to understand that meditation the quietening of our created parental voice begins to relax these judgemental voices that we have picked up in our dysfunctional childhoods. The understanding that the God/Goddess/Universe/Creator/Spirit/Higher Power are externalised judgemental voices which collude in keeping us in a cage of safety and dull us down. We awaken the healing wisdom within us when we open ourselves to the power of our meditations. At this stage the seeds of our authentic selves and trust in the healing power of the truth starts to permeate back into our consciousness. We come to understand that since there is a form of universality within us, this is a true self within ourselves. We came to recognise that this God/personalised parental figure outside of us and beyond us, that this externalised God, who is essentially little more than an idealised, fantasy parent, can not save us and we are not being disloyal to reject it. Basically,The coping strategy of the belief system tells us that we can’t take care of ourselves because we are too wounded as children, too completely damaged, but our idealised Mommy/Daddy can still save us! We just have to put our faith back in Mommy – and hopefully a better fantasised Mommy than we had the first time around not the one who participated in crushing our personality and making us into such a deranged dysfunctional person.If we are having problems with mommy/daddy figures we can conceptualise another dysfunctional parental figure for ourselves. During our study of Stageology we examine our beliefs, addictions, and dependent behaviour in the context of living in a male dominated society & culture. We will explore affirmations and start to understand ourselves. We will examine with our trusted friends a new life affirming belief that we can really take care of ourselves and heal our own wounds, and we will consciously decide that this externalisation of our split-off inner self – this external God of an-others creation – cannot save us. This belief shatters our unconscious, grandiose, and immature idea that we can be the king of our own self-proclaimed universe. This dysfunctionally created belief of other or outside God that simply place it on something external, which allows us all the while to keep alive a façade of humility. When we speak of God or Higher Power we are really speaking of the our own unconscious, grandiose feelings about ourselves, which follow the exact template of our idealised image of our dysfunction parental and grand parental figures. We start to share and come to an understanding with our trusted compatriots all those things inside of us for which we feel shame and guilt as we have come to identify them. Now that we have worked hard to believe that we do have a true and honest self within. We have come to understand at this stage that our old lives lived under the mounds of unresolved childhood trauma which we did not believe we ever had. We will look within, explore to find out what else might be just be within side us. We will take an emotional inventory of the traumas foisted on us when we were a child. These revelations might force us to discover that our parents really did mess us up worse than we first thought, and that we gain a realisation of the level of upwelling pain and anger coming from that discovery were at the roots of our addictions. That the old patterns of addiction were really self-medication and the inevitable flight from reality. We do not do a “moral” inventory, that will only replay our childhood trauma just by studying our morals, our own “badness” and hurtful behaviour .The reasons are that the mere act of revisiting childhood trauma and the frozen self is that we have already been programmed to come to believe firmly that we had no true self. Therefore we are indoctrinated with a false unrealistic self that tried to root us in the deepest moral and inner goodness of an idealised fantasy society which reinforced our denial of our inner truth. Stageology We come to recognise and enjoy our own intelligence, strengths and creativity, remembering not to hide these qualities from ourselves and others. With the newly found self-reflection as to where our acting out behaviour might have come from that is, an acknowledgement that our disturbed patterns are simply a replication of the traumas done to us when we were vulnerable and innocent and powerless in our family as a child. We will now start to understand all the bad things that others have done to us. We will reject these previous lists of perceived badness drawn up by our tormentors and the people who sort to control us.During this stage we will come to understand that by being forced to admit to this externalised God of another creation (which we have become convinced NOW is separate from the essence of me!) and to the controlling persons who buy into this deluded and dissociative philosophy. They rubbed salt into our already wounded self which only further traumatised us paralysing us both psychically and emotionally. We threw ourselves down a blind alley of despair, and further cut ourselves off the from deeper healing roots of ourself that has the power to heal us. Stageology We become willing to let go of guilt, shame and any behaviour that prevents us from loving ourselves and others. Now that having explored what was done to us and what motivates our dysfunctional behaviour –We strongly reject the conformity of belief that we need to be pleasing in the eyes of this external God (Mommy), on that basis will be ready and able to be loved once again. This belief which in the past had given us such a warm feeling inside, a dissociative feeling which we would mistakingly take for being a sign-marker on our path to love and enlightenment. We must always remember that no one but the family of the others is in reality responsible for our perceived “defective character,” but the responsibility is with Mommy herself! Mommy the one who will save us is the perpetual myth faced in this stage. She has everything do to with why our belief system are so messed up! Even if Mommy is not present, the conceptualised commercial mommy peers down at us from each advertising hoarding or if we switch on the television and tune to a soap we will see a mother figure posturing with its moral judgemental stance. Stageology . We gently recount and examine our learned dysfunctional lives having been harmed examining the people and institutions that have harmed us, and take steps to clear out negative energy by fully understanding and sharing our grievances in a respectful way. We come to understand healthy alternatives to the behaviours that we can practice in our recovery and discuss them at length evolving them as we mature. We start to recognise the internal voices in our heads and where they originate. Please Mommy/God, now that We’ve admitted how bad we are, and how much We’ve hurt you, and how naughty We’ve been, will you love us again and tell us that I’m a good boy/girl? We’ll do anything you say. We really do love you, We really, really do. And We always did love you deep down, even though you did horrible things to us which we can’t seem to remember anyway because we were so pickled ourselves with booze/drugs/dysfunctional behaviour's to try to blot out the memories. Please tell us We are a good boys/girls again! The reinforcing guilt and shame that this stage addresses and the voices of judgement and shame that we recreate in our subconscious have once more to be addressed with a greater evolving understanding. Stageology Is about expressing love and gratitude to others and increasingly appreciate the wonder of life and the blessings we do have. Now We are really going to change our viewpoint and perspective….. We are going to stop being a bad boys/girl s and be a good boys/girls again, and prove to you that We really were good boys/girls all along, even though deep down underneath all our grandiose façade We still think that We are the pathological, worthless, evil, vile, stinking, rotten, useless, hopeless, piece of dogs**t that you always subtly and sometimes not so subtly taught us .This the reasons why We drank/drugged so much and so destructively. But now We are going to make it all right for the world, even though I’ve still never even come close to looking at the harm that you, Mommy, and you, Daddy, did to me. But We are the bigger person! We have already forgiven you – even though We really have no clue exactly what We have forgiven you for. Change is found at this stage by acknowledging the inner child's voice by understanding at a deeply conscious level what we can accept that voice, and what we cannot list or acknowledge we let it go of at this stage of the course. Stageology Study. We have come a long way. We have learnt to trust our reality and daily affirm that we see what we see, we know what we know and we feel what we feel. We promptly admit to our dissociations and make amends to ourselves when appropriate, but we do not say we are sorry for things we have not done and we do not cover up, analyse or take responsibility for the shortcomings of others. We’ll change our ways. We’ll be so dissociated and split-off from my deep and churning inner rage and fury and misery and sadness over what was done to us that We’ll come across like the Best Little Boys/Girls in the whole wide world, and We’ll prove to you that We’ve changed. And on the surface WE WILL change. We’ll sure we seem different. We won’t get plastered and get violent for no reason and puke all over the new carpets and drive like an intoxicated maniac and frighten the hell out of everyone and force you to live with a pink elephant in your living room. No, the only pink elephant left in our life will be the pink elephant of my entire unconscious, which We won’t notice anymore because it will just get in our way. We’ll smile and convince you that We are reformed, even though underneath it We’ll still be as deformed as ever. Dissociation is not reality and until we come to a deep understanding of what has happened to us no healing can take place, no meditation will work, no religious practice will have any meaning. We will remain deeply dysfunctional without the symptoms being visible the cancerous cells of our hurt psyche will proceed onwards. Stageology We seek out situations,jobs, and people that affirm our intelligence, perceptions, and self-worth and avoid situations or people who are hurtful harmful, or demeaning to us. We take steps to heal our physical bodies, organise our lives, reduce stress, and have fun. We seek to find our inward calling, and develop the will and wisdom to follow it. We accept the ups and downs of life as natural events that can be used as lessons for our growth. We grow in awareness that we are sacred beings, interrelated with all living things, and we contribute to restoring peace and balance on the planet. Now We will realise our dissociation. We will renounce clinging to a philosophy and the self that is full of holes, We will start to practice a new way of life, the art of becoming real. We will have gone deep inside the root of our being. In our reality without just practicing splitting off from living in the present moment and making it look fancy to myself and others. We will stop talking to God of another understanding in prayer because We have no idea who God really is. We will listen to the universe in meditation and be able to realise that We are affirming the deepest and most basic essences of our souls. We will have found ourselves and will now have a beautiful full capacity that I’m come home to myself at last! Overrider for those of us deprogramming from the fellowships and have our self-worth invested in converting others. REMEMBER THIS IS A TAUGHT COURSE (not a cult, you pay for the course and there is a cut of date everything after that is socialising and enjoyment.We do not have any groups, mentors, sponsors or gurus.This is about unlearning not learning we are all born perfect.) Now that We have started to become enlightened and free from the twisted thinking ( theres not ours) that resulted in our dysfunction (that is, not dissociated) and no longer need an addictive process to achieve this dissociated state, We will understand real peace in our reality.We will not and go out and begin a mission to proselytise my version of “the truth.” We will renounce the idea that we have to manipulate others who use addictions to dissociate from their unresolved childhood traumas to follow their ( another form of recovery largely unreliable program) and to split-off from their ancient wounds just as we have done. We will renounce the idea that we have to convert anybody by insulting and degrading and pathologising them. We have to acknowledge that It will reinfect us and rebuild the sick selfs very grandiose ways to cajole other traumatised addicts of the dysfunctional paths into dissociating by requesting that they follow our adopted methods The Ten Stages and the Child Within, but We will acknowledge this as our grandiosity and old outmoded coping strategy an enemy of our newly found reality.